Updated for 2017, we bring you the ultimate guide to Las Vegas casinos. Want the best guide to all of the casinos in Las Vegas? Las Vegas is home to almost 60 casinos in an around the City with each having a particular draw to try and attract punters inside. In this guide, we give you a complete guide to all the casinos in Las Vegas including those on the outskirts and not just the big names. This five star (and five diamond) hotel is a part of the mixed-use, urban city complex on the strip. At 4,000,000 sq ft internal space and standing 600 ft high, it is the tallest and largest structure in the development. The hotel has 4004 rooms, 10 bars, a nightclub and 16 restaurants to complement the grand casino. The latter is managed by a 3,000 sq ft data centre which monitors the gaming and matches the machines to provide the most popular games in response to real-time analysis of the performance of each machine. Aria has skylights and exterior windows in a break from the Las Vegas traditions of omitting natural light. The second Arizona Charlies to open in Las Vegas (see below), the boulder casino and hotel is situated on the Boulder Highway (between Sam’s Town and Boulder Station) to the south-east of Las Vegas. Designed as a local’s casino rather than accommodating the tourist trappings of the Strip, Arizona Charlie’s Boulder incorporates a two-star hotel with 301 rooms in this small complex. There is also an RV park adjacent to the casino for travelling sunbirds. The casino runs a race and sportsbook in addition to slots, bingo and other table games. A two-star venue, Arizona Charlie’s is a popular local’s casino. Image via Arizona Charlies (Google). Arizona Charlies is situated on the Decatur Boulevard and 10.4 miles away from the Boulder venue. It features an award-winning bingo hall, 1100 slot machines and classic Pai Gow poker, roulette, blackjack and craps. They have a poker room and operate a popular Race & Sports Book. The venue is designed in a colonial New Orleans style and is well attended by locals as well as tourists on a budget. Formerly the MGM Grand, Bally’s Las Vegas was once the largest hotel in the world and is larger than the Empire State Building. Opened in 1973 with Dean Martin at the helm of the entertainment, the venue has a long history having a casino on the existing site since 1963. The casino has featured in many films including Rocky IV, Honeymoon in Vegas and The Incredible Burt Wonderstone. It is also featured in the popular video game, Grand Theft Auto: San Andreas. Bally’s has a keno lounge, table games, slot machines and regular Las Vegas poker tournaments. They also run a sports and race betting book. Popular table games include Pai Gow Poker, Let It Ride and Chinese Dominoes (or Pai Gow Tiles). This luxury hotel and casino complex is inspired by Lake Como in Bellagio, Italy and was built on the site of the former super hotel/casino, the Dunes. The complex is opulent in almost every area including the lobby which houses 2000 hand blown glass flowers that adorn the ceiling entrance. The casino has all of the usual attractions but is also home to the iconic ‘Bobby’s Room’. A base for many professional poker players, the room is named after poker legend Bobby Baldwin. Bobby’s Room is renowned for its high stakes with pots reported to sometimes exceed $1 million. The complex also has several attractions to draw extra visitors including the Fountains of Bellagio, the Bellagio Gallery of Fine Art and the conservatory and botanical gardens. The fountains are particularly popular and are synchronized to music over an eight acre lake. The Fountains of Bellagio are the calling card of this casino. Image via website. Owned by: TLC Casino Enterprises Inc. Formerly a hotel and casino, the hotel closed in 2009 leaving the casino as a standalone operation. Named after the Binion family who ran the site from 1951 to 2004, the casino was originally called Binion’s Horseshoe. The casino floor is home to the famous $1,000,000 display; an attraction of actual banknotes totaling $1 million. The casino is well-run and a great place to gamble for beginners looking for a friendly environment to learn without being taken advantage of. The venue features in the DTour behind-the-scenes reality TV series, Casino Confidential. Designed on a Wild West theme, Buffalo Bill’s casino resort is one of Vegas’s iconic buildings. With the huge roller coaster dominating its facade, the Desperado is one of the highest (225 ft. drop) and fastest (80 mph) in the world. The resort is home to a 6,500-seat arena, Star of the Desert, which regularly hosts concerts. The casino has the usual trappings of Las Vegas including 1700 slot machines, gaming tables and sports and race but it is the amusement park that brings the most visitors. A AAA four diamond hotel, Caesars Palace is a luxury resort and is one of Las Vegas’s most iconic casinos. One of the world’s most luxurious and prestigious casino hotels, Caesars Palace was the brainchild of developer, Jay Sarno, who wanted to evoke the opulence of the Roman Empire. Whilst the hotel design was geared towards the rich and famous, the casino has always been operated as a high rollers venue. It contains a 4,500 sq. ft. 24 hour poker room and is a modern facility with thousands of slot machines, traditional table games as well as video poker games. The venue is a must on any visitors list and is a one-off experience. Caesars has been the biggest name in Las Vegas since it opened in 1966. Image via Wikimedia. Colloquially known as ‘the Cal’, the resort was one of Sam Boyd’s first Las Vegas venues. Originally less than a success, the venue began appealing to the Hawaiian market offering Hawaiian food and introducing discounted package vacations from the island to Vegas. The venue is credited with the rise of the Hawaiian community in Vegas. It’s biggest claim to fame is the feat performed by Stanley Fujitake in 1989 who rolled continuously in a 3 hour and 6 minute session of craps without losing. The casino is nothing special but offers a less busy venue to be able to learn the ropes for beginners. A locals casino in North Vegas the Cannery is a popular venue that hosts regular festivals both indoors and outdoors. The Club can be opened up to provide an amphitheatre indoor/outdoor space. The casino has 1650 slot and video poker machines as well as blackjack, craps and Texas Hold ‘em poker. Many people will be disappointed by the Casino Royale when they happen upon it expecting a 007 experience. However, this mid-range 3 star hotel on the strip offers great value accommodation in the heart of the city with an excellent low-rollers casino if you want better odds. In an effort to bring the punters in, the casino runs regular promotions including low table minimums, better odds and waiving a resort fee. Designed like a giant circus tent, Circus Circus was the flagship casino for Circus Circus Enterprises when it opened in the late 1960s. It is still the largest permanent big top tent structure in the world. The main draw to the casino is the surrounding setting and entertainment which features regular circus acts and carnival games. The casino has slots, table games and a race and sports book. As well as the casino, Circus Circus has a wedding chapel (Chapel of the Fountain), three swimming pools and a five acre indoor amusement/adventure park that includes a roller coaster, miniature golf course, virtual reality zone and rock climbing wall. Circus Circus operates a popular race and sports book. Image via website. Whilst Fitzgeralds ran with a ‘luck o’ the Irish’ theme, newly renovated (2012) The D is replacing the leprechauns and shamrocks with sleek modern styling. The casino is split over two floors and incorporates 22 game tables and 1000 slot machines. Some of the dealers are dancers and the second floor is a vintage Vegas themed gaming area. The Lady Luck casino ran continuously from 1964 to 2006 when major renovations were undertaken before the resort was unveiled in 2013 as the Downtown Grand, the jewel in the crown of the new Downtown3rd development. With an onsite William Hill sportsbook and an award winning selection of slots the casino has a friendly atmosphere. There are 500 slot machines, blackjack, craps, roulette and Pai Gow tables as well as video poker. One of the first casinos built in Las Vegas, El Cortez is small by comparison to its surrounding competitors. In the 1940s, the El Cortez was the first major resort in the city and, despite detractors considering the location unsuitable, was quickly very profitable. The exterior signage, façade and architecture have remained unchanged since it was first built and retains the Spanish ranch themed setting. The casino is one of very few in Las Vegas which still operate ‘loose’ slot machines and includes penny and nickel machines. It runs regular table games, keno lounge and sports books. Undergoing major refurbishment in 2006, the casino is popular with locals as well as tourists to Downtown Las Vegas. Located in the suburbs of Las Vegas in Henderson, Eldorado has a bingo parlor, keno parlor and sports book in addition to the 434 slot machines and gaming tables. The casino was previously known as the Wheel Casino and is run by Boyd Gaming as a training casino for its management staff. As one of the oldest establishments in the Las Vegas area, Eldorado benefitted from a $700,000 refurbishment in 2007. Having been awarded five AAA diamonds since it opened in 2008, the Encore (as part of the Wynn Resorts complex) is a luxury hotel and casino; together they form the world’s seventh largest hotel. Considered to be one of the finest hotels and resorts in the world, the Encore operates a world-class casino experience featuring private rooms with a high limit. Encore dominates the Las Vegas skyline and is one of the best hotels in the world. Image via Wikimedia. Named after the mythical sword from Arthurian legend, the Excalibur has a medieval theme and is one of the most popular tourist resorts on the Strip, particularly for families. The castle façade hides a myriad of attractions from its huge gaming floor featuring 1200 slot machines and various table games to a live music lounge, food court and eight restaurants. The resort regularly runs jousting tournaments in their arena as well as the ‘fun dungeon’ – not what you’d think but instead an amusement arcade. Previously known simply as Fiesta, the Fiesta Rancho resort has a good range of video poker, slot machines and classic table games. The resort appeals to locals as well as tourists and holds bingo, keno and a race and sports book. In 2003, the venue was voted the best establishment for video poker by the Las Vegas Review-Journal and continues with an award for its bingo in 2011. The oldest casino in Vegas, the Flamingo occupies a 15-acre site and is designed around a Miami South Beach setting in an Art Deco style. It was the third resort to open in Vegas following the Nevada state legalization of gambling, post-prohibition. With a sports book, video poker, slots and plenty of gaming tables the flamingo remains a popular tourist attraction. The garden features Chilean flamingos to complement its tropical theme. Situated in downtown Vegas the Four Queens has over 1000 slots a classic selection of table games including Blackjack Switch, Let-It-Ride and Mississippi as well as a Keno Lounge and Sports Book. The casino is named after the original builder’s four daughters; Michele, Benita, Faith and Hope. It was the first Vegas venue to offer Geoff Hall’s Blackjack Switch. Part of Downtown’s four corners attractions, the 4 Queens is one of the city’s oldest casinos/ Image via Wikimedia. Situated in downtown Las Vegas, the Fremont Casino was the tallest building in Nevada when it opened in 1956 and is part of the attraction known as the ‘Fremont Street Experience’. Made up of the ‘four corners’, the Fremont (in addition to the Four Queens, Binions Gambling Hall and the Golden Nugget) is one of the oldest casinos in Vegas. The casino has over 1000 slots, 24 different table games and video keno and poker. A local’s casino in the Paradise area of Vegas, Gold Coast closed its poker rooms in 2011 but still operates slots and some table games. The venue is popular as an eatery and runs regular entertainment. There is some speculation over the future of the Gold Coast due to the proximity of the Palms Casino Resort and the Rio. A four-star hotel, the Golden Nugget is the largest casino in the downtown area and is an iconic building that features in many films. It is one of the oldest casinos in Vegas and was the foundation of Steve Wynn’s prominence in the city when he purchased a majority share of the venue in 1973. The casino is the epitome of how many people still envisage Vegas and is a popular destination for gaming. They offer a classic range of table games, slots and sports/race book as well as several tournaments. An iconic casino, the Golden Nugget is instantly recognizable. Image via Wikimedia. With its expansive facilities and Mediterranean theme, the Green Valley Ranch sits at the heart of the community of the same name, to the southeast of the city. It was the subject of the reality TV series, American Casino, filmed in 2004. Green Valley Ranch’s casino is a big one and accommodates a lot of tourists staying in both Henderson and Las Vegas itself. An upscale venue, it is a popular out-of-city gaming establishment to get away from the main drag of Vegas casinos. A popular four-star hotel and casino on the strip, Hard Rock is predominantly a tourist attraction offering entertainment and accommodation. The venue has three cocktail lounges, six restaurants., live music room and a nightclub in addition to its Tahitian style beach and pool club. Whilst the casino is always busy, the Hard Rock only earns around 30% of its income from gambling. The casino does have a swim -up blackjack area, high limit slot machine room and the usual table games. A busy casino, the Hard Rock Las Vegas is popular with visiting tourists. Image via Flickr. A three-star hotel and casino, Harrah’s is not a luxury venue but is still a landmark attraction in Vegas, being one of the stalwarts of the city. The casino is just one of its attractions, the other notable ones being Carnival Court. It is popular with tourists and families and has plenty of eateries. The casino has a keno lounge, poker room and a sports and race book in addition to its huge variety of slots and table games. Originally the Howard Johnson Hotel, the Paradise Hotel and Hotel San Remo, Hooters purchased the venue and renovated it with a $190 million programme of upgrades in 2006. Re-opening its doors on the day of the Super Bowl XL, the venue has been a popular one with its consistent branding and regular entertainment. The casino is located on the main strip opposite the MGM Grand and adjacent to the Tropicana. Hooters has one of the lowest gaming revenues in Las Vegas but one of the highest ratios of gaming to non-gaming incomes. The casino has a range of classic games and runs a William Hill sportsbook. The ‘Hooterific’ Casino at Hooters…sticking to brand. Image via website. Formerly the Cattle Baron Casino, Jokers Wild was opened after a refurbishment in 1993. The biggest draw for this locals casino outside the city is the Race & Sports book. This local’s casino in Henderson was the sister property to a strip-based casino by the same name until it closed in 2016. Originally known as Tom’s Sunset Casino, the venue was refurbished in 2016. A tiny casino, there are no table games just slots. The Egyptian themed three-star hotel with its iconic pyramid, sphinx and tombs was built using ‘petty cash’ by Circus Circus Enterprises and did not require any outside investment. At the time of its opening in 1993, the pyramid was the tallest structure on the strip. It is the third largest hotel in Vegas and the ninth largest in the world. The casino contains a replica of King Tutankhamen’s tomb and features over 2,000 slot machines as well as 87 table games. The resort has a wedding chapel, spa and salon and 30 retail stores. It is a popular venue for tourists with families. As well as the Egyptian attractions, the Luxor features the Sky Beam; a 42.3 billion candela ray of light which projects from the top of the pyramid. It is the strongest beam of light in the world and can be seen up to 275 miles away. There is no mistaking the theme of Luxor’s casino. Image via Pixabay. Modelled on a classic American railway station, this three-star hotel and casino in downtown Las Vegas offers a variety of attractions to get punters through the door. There is a self-guided tour in which you can take in oddities such as a piece of the Berlin Wall located in the men’s restroom, chandeliers from the Coca-Cola building and the Louisa May Alcott Pullman car. The site is also home to a microbrewery (The Triple 7) which makes five different types of draught beers. You can enjoy your favorite table games in the small casino as well as 700 slots. Though one building, the Mandalay Bay is split into two ownerships with one of the towers operating as a hotel) being run as a Four Seasons Hotel, independent from Mandalay. The property is connected by the Mandalay Bay Tram to its two sister properties, Excalibur and Luxor. Colored with gold leaf across its windows, the building is a beacon of extravagance but is a four-star property. The expansive casino operates 1700 slots, plenty of table and card games as well as a sportsbook. Home to 24 restaurants 11 bars and nightclubs as well as one of the largest privately owned convention centres in the world, Mandalay Bay is a very busy resort. A four-star hotel with a big reputation, the MGM Grand is another landmark building in the city. It forms the largest single hotel in the USA and the third largest hotel complex in the world. With one of the city’s largest gaming floors, the MGM Grand is a very popular casino. There are more than 2500 slots, 139 poker and table games as well as a high limit lounge that has up to $500,000 payouts. The casino is known as the $1-$2 No Limit capital of Las Vegas when it comes to poker and regularly attracts huge numbers of gamblers. There is also a state of the art sports book lounge with 36 65” plasma TVs screening football, boxing and soccer. The MGM also has a huge selection of skill-based games in their Level Up Lounge. The biggest single hotel in the USA, the MGM Grand has one of the largest gaming floors in Vegas. Image via Wikimedia. The Mirage is still famous for its white tigers that were once housed within the resort as part of the famous Siegfried and Roy magic show. Though the tigers are long gone, the marquee sign to the front of the resort is still there and remains the world’s largest freestanding marquee. In 2012, the casino became the second Vegas venue to offer Free Bet Blackjack, a variant of blackjack invented by Geoff Hall. With a triple A, diamond rating this mega resort casino and hotel is currently under refurbishment and will be known as the Park MGM when it is completed in 2018. The resort is designed around the theme, unsurprisingly, of Monte Carlo and features opulence at every turn including gas lit promenades, marble floors and huge chandelier domes. The resort has a huge amount of facilities on top of the casino including 22,000 sq. ft. of retail space. The casino has table games, slots and a sports and racing book plus a high limit table area. With a design intended to evoke the skyline of 1930s New York, this resort is a popular tourist attraction and features an interior roller coaster, a dozen bars, nightclub and cabaret theater. One of the bars, the Center Bar is situated in the middle of the main casino floor. Speaking of the casino, at weekends gamblers can enjoy live entertainment in the ‘party pit’, an elevated stage within one of the table game pits. New York, New York, it’s a helluva…casino. Image via Wikimedia. When this New Orleans themed casino and hotel originally opened in 1996 it was considered a bit of a flop. Accordingly, major new changes were made with additions in 1999 to expand the casino and improve the facilities. These improvements were felt in the bottom line and the casino has continued to add extra amenities, adding a second hotel tower in 2004 and an arena in 2003; the latter playing host to some major names in comedy, music and film. It now includes a cinema, bowling centre with 70 lanes and pro shop, beauty salon and video game arcade. 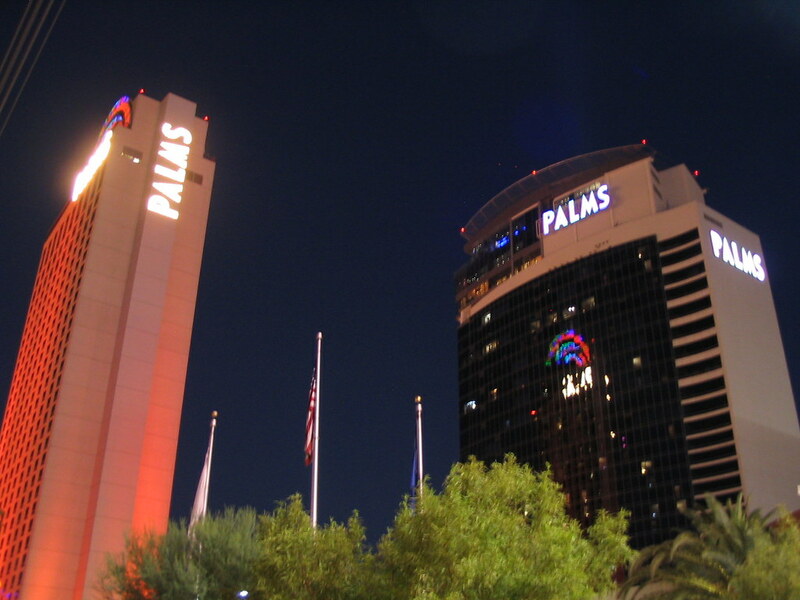 The Palms has earned itself a reputation for being a celebrity hangout and has, as a result, become a mecca for star-spotters of the younger generation. The Sky Villas and Fantasy Suites are some of the most expensive hotel rooms in the world. The casino has plenty of plush lounges, classic table games and exciting slot machines. You can play roulette, three card poker and the ultimate Texas Hold ‘em. The Palms, Las Vegas; attended by the rich and famous. Image via Flickr. The Paris Las Vegas boasts a half scale replica of the Eiffel Tower as well as impressive models of the Arc de Triomphe, the Montgolfier Balloon and La Fontaine des Mers. It is a popular tourist resort and also attracts good crowds to its nightclub, Chateau. The casino features the usual games, slots and events but also the Gamblit Poker game, Cannonbeards Treasure. There has been a casino on this site since 1963, first as the Tally Ho (1963-1966) and the Aladdin (1966-2007). The buildings were demolished in 1998 with the exception of the Aladdin Theater to make way for the Planet Hollywood resort. Riding on a wave of popularity following the opening of the original ‘Planet Hollywood’ restaurant in New York in 1991, the opening of a Las Vegas resort was inevitable. The casino, bedecked in Hollywood stylings, was the first venue in Vegas to offer table games with scantily clad female dealers. The venue also offers Gamblit skill-based gaming as well as classic table games, slots and The Playing Field Race and Sports Book. The slots at Planet Hollywood. Image via website. A downtown Vegas casino, the Plaza has recently completed a $35 million renovation. The casino has a Keno lounge, slots and traditional table games. The resort is very standard, with a three-star hotel, but suits a mid-range budget. The venue has a rooftop pool and fitness centre. The Rampart has 1,230 slot machines, a race and sports book with 22 table games and two entertainment lounges. A local’s casino in the Summerlin area of Vegas, the Rampart was renovated in 2002 and remains a well-frequented gaming establishment. It is situated in the JW Marriott Las Vegas Resort and Spa but is a separately owned entity. The Rio All Suite Hotel and Casino is influenced by Brazilian culture and reflects a tropical style in its architecture and interior design. Originally opened as a locals casino it is the host casino for the WSOP. The casino has a sports and race book, 1200 slot machines and 350 video poker machines. You can play No Limit Hold ‘em, Seven Card Stud, and Omaha poker. In addition to the casino, Rio offers a huge wine cellar housing 50,000 bottles all of which are available for tasting…just not all at once. Rio, Las Vegas is the home of WSOP. Image via website. One of the original Las Vegas valley locals casinos, Sam’s Town is built on a site of 13 acres and incorporates two RV parks. The gaming here is friendly with a good atmosphere and incorporates plenty of slots, tables and video poker machines. The venue is famous for being the host hotel for the Sam’s Town 300 NASCAR race. Operating as the Sahara Hotel and Casino from 1952 to 2011, the SLS is the last stop on the Vegas monorail to the north of the city. It was renovated in 2014 with a $415 million refurbishment programme and now offers 9 restaurants, a rooftop pool and night club and spa. It was sold in May 2017 to the Meruelo Group but no reported changes are being made. The casino features dramatic styling and incorporates 600 slot and video poker machines, 60 classic table games and a high limit room, known as ‘Foxtail’. The observation tower known as Stratosphere is 1,149 ft. tall and is the largest free standing tower of its kind in the United States (second tallest in the Western Hemisphere). The casino and hotel are located in a separate building. The casino has 1500 slot machines, 50 table games and offers a race and sports book as well as regular entertainment. The newly remodeled sports book lounge at the Stratosphere. Image via website. Formerly the tallest structure on the west of Vegas, Sun Coast Hotel and Casino has a large and popular casino boasting over 2000 slot machines alongside a good range of table games. The venue hosts regular events including Las Vegas based wrestling, the Artisan Craft Fair and Extreme TV. It was the first major venue in Las Vegas to trial the technology of coinless slot machines. This boutique hotel/casino owned by Caesars is a luxury venue on a small scale having just 188 rooms. It stands on the site of the 1952 casino, Empey’s Desert Villa and was opened in 1979. It was formerly known as both Barbary Coast and Bill’s Gamblin’ Hall and Saloon until it was renovated and reopened in 2014 at a cost of $185 million. With a beachclub, nightclub and the Giada restaurant, The Cromwell offers a taste of elegance without the trappings of a mega resort. The casino, small by comparison to many other Caesars offerings has 66 table games, slots and a high limit lounge. For more exclusive gaming, The Cromwell has a three table private room called ‘The Abbey’. The Cromwell is in the heart of the Strip. Image via Wikimedia. Operating as the Flamingo Capri from 1959-1979, the Imperial Palace from 1979-2012 and The Quad from 2012-2014, the Linq was opened in January 2014 following a $223 million renovation. The casino, O’Sheas, attracts a young crowd in their 20s and 30s and is known as a party casino. The gaming area has 5 beer pong tables. The resort has a 550 ft tool ferris wheel known as the ‘High Roller’ and houses a classic car showroom to help draw in the punters. A relatively new addition to the Strip, The Palazzo is the tallest building in Las Vegas. It is modelled on the Italian Renaissance style and is named as the largest hotel in the world in the Guinness World Book of Records. The casino offers Imperial Baccarat, Stadium Blackjack and poker at the adjoining Venetian resort. Officially the biggest hotel in the world, The Palazzo dominates it’s surroundings. Image via Wikimedia. Also known as TI, Treasure Island has a four diamond AAA rating and was originaly opened as part of the Mirage Resorts by Steve Wynn in 1993. Originally appealing to families with its pirate themed nautical stylings, Treasure Island was very popular with tourists travelling with children. Not known for their all-night gambling activities, parents were perhaps not the best of target audiences for a casino and the pirate theme was dropped in 2003. The venue’s pirate theme has steadily been replaced by a more simple and modern Caribbean styling. The casino incorporates a poker room, race and sports book as well as slots and classic table games. For high rollers, there is also a High Limit Lounge. A franchise of the Hilton Double Tree chain, Tropicana is a busy exhibition and convention space with huge gaming floor. The casino and hotel have featured in plenty of movies including the James Bond film, Diamonds are Forever, Viva Las Vegas starring Elvis Presley and The Godfather. A new sportsbook was opened in 2011 by Cantor Gaming. Table games include Mississippi Stud, High Card Flush and Bonus Spin Blackjack. There are 800 slots and the Tropicana won the ‘Best Paying Slots’ title in 2014. Situated on the former site of the famous ‘Sands’ resort, the Venetian is a luxury hotel and casino forming the world’s second largest hotel (with the adjacent Palazzo Hotel). Designed in a (surprisingly) Venetian style, the resort was opened to a fanfare of singing gondoliers, trumpets and white doves with actress, Sophia Loren presiding over the affair. The casino was the first to have a 24/7 sportsbook open in Las Vegas in 2011 (operated by Cantor). If gamers get tired of the Venetian Poker Room, slots, stadium blackjack, imperial baccarat and table games, they can always take a gondola ride down the Grand Canal. Operated as the International Hotel from 1969-1971 then as a Hilton from 1971-2014 when the resort was taken over by Westgate Resorts. The casino is home to the largest race sports book in Vegas and the casino has an assortment of table games, slot machines and video poker. This small casino and hotel was formerly known as the Maxim Hotel until it was taken over by Columbia Sussex in 2001. It is perhaps most famous for being the location of the tragic murder of rapper, Tupac Shakur, who died as a result of injuries sustained in a pull-up shooting at the Maxim in 1996. The casino facilities at the Westin are being phased out. Previously known as the King 8 Hotel, the Wild Wild West is the source of some speculation at the current time. With the owners purchasing adjoining land, it is widely expected that a major refurbishment is planned. At present, the casino and hotel is very small compared to the 58 acres it occupied with a further 52 acres having recently been purchased. With its Western theme, the Wild Wild West is branded as a Days Inn venue but is actually owned by Station Casinos. The casino is very small but is well located for the international airport. Simply known as Wynn, this $2.7 billion resort is the flagship property of Wynn Resorts and is considered to be one of the world’s best hotels. It holds five AAA diamonds along with five stars with Forbes, Mobil and Michelin. The casino is also a prestigious affair and offers a taste of luxury within its huge interior. You can even play blackjack and craps poolside at the adults-only European pool. The casino also features anti-counterfeiting technology with RFID inside the chips. There is nowhere more opulent to play the slots in Vegas than at Wynns. Image via website. Featured image, Las Vegas Boulevard via Flickr.